Armory Square is bursting at the seams – the last of its vacant buildings are coming to life, and new developments at its fringe are leading the charge to expand the street life into adjacent areas. 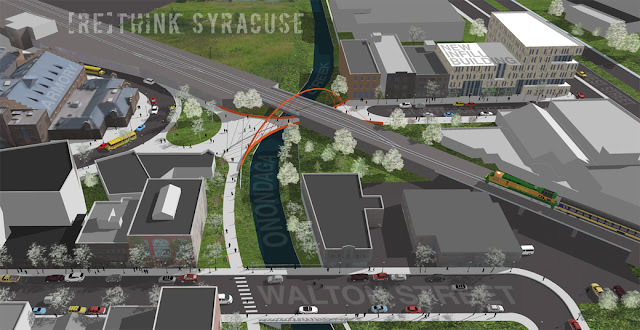 This expansion, though, is largely to the north and east of the square; the elevated railroad tracks to the south and Onondaga Creek to the west serve as perceived boundaries not to be crossed. Were you to look beyond the point where these two boundaries meet, just to the west of the armory, you would notice a row of buildings not unlike many of the others in Armory Square; yet, you wouldn’t know how to reach them nor have any idea if they’re even worth reaching in the first place. This little strip, a one-block long segment of West Jefferson Street, was at one point long ago connected across the creek to the oval encircling the armory. What’s stopping us from reuniting this disconnected and forgotten block with the whole of Armory Square? The construction of a highly visible and well-placed pedestrian bridge, crossing the creek while ducking under the elevated railway, would allow the energy of Armory Square to break through its western boundary. The underutilized buildings immediately across the creek would find new life as shops, restaurants, and apartments. New infill development would populate the adjacent vacant land, resulting in an active and safe connection to West Street and the Near Westside beyond. Coupled with the newly completed creekwalk, the creek crossing would provide ample space for gatherings such as festivals, markets, and recreation. By reclaiming “borderlands” such as these, people are encouraged to experience and discover parts of the city that may have previously been outside of their comfort zone. More interactive and habitable spaces, iconic structures, and variety of environments will continue to accelerate the growth of Armory Square and pull some of this growing energy through its fringes and into the city at large. Again, what’s stopping us? Also, I see a lot of phototextured buildings... are you working on models for Google Earth? We should combine efforts. This is interesting and I agree, why not connect and make things more viberant. I have always thought that Armory Square, while nice, has missed the mark in part. With no grocery or other daily needs, I am not sure what the perk of living down there is. 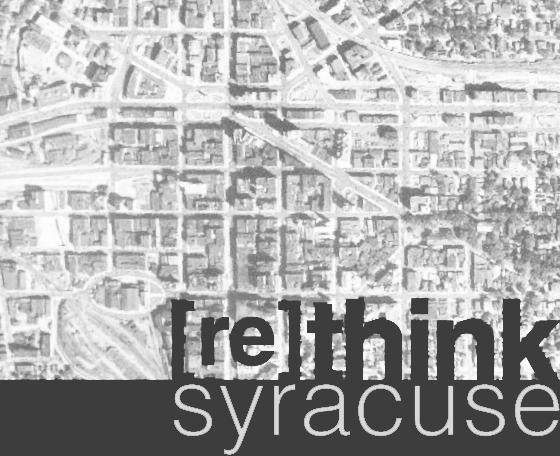 I wish Syracuse would find a way to create city neighborhoods, like Buffalo, where you can live in a house, but walk to stores etc. This Manhattan envy that seems to infect parts of upstate is just unnecessary. We have good way of life up here, and needn't always try to look and be like NYC.